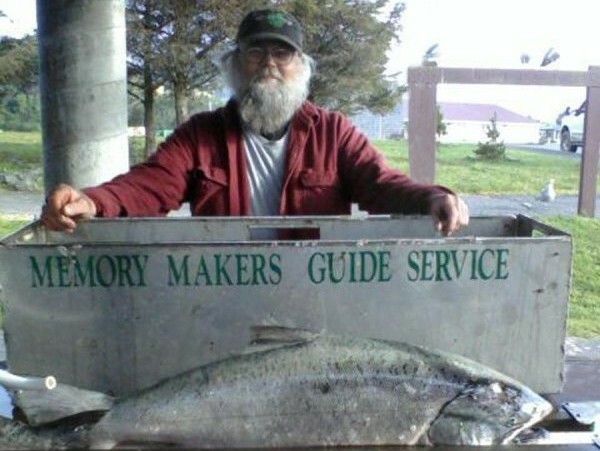 Welcome to my site and to the Southern Oregon coast, where I have been fishing for Salmon and Steelhead since 1988 and have been blessed to make Gold Beach, Oregon, the mouth of the Rogue River, my home. 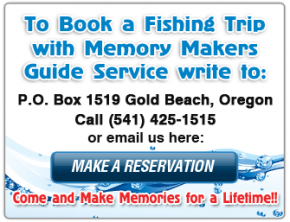 Come and fish for Salmon and Steelhead on the rivers of the southern Oregon coast with Memory Makers Rogue River Guide Service and make happy memories for a life time. I fish three primary rivers: the lower Rogue River in Gold Beach, the Coquille River in Bandon, and the Coos River in Coos Bay/North Bend. When you fish with me, we’ll fish whichever river is having the best runs of Salmon at the time. However, your choice always come first, as my goal is to please you with the best adventure possible. We start salmon fishing for Oregon’s best Spring Chinook (Springers) the end of March through the middle of June. The size of a Rogue River Springer is from 16 to mid-40 pounds, with the average size of the Rogue River Springer being in the 20 pound range. When you fish with me, not only do I put you in the best position possible to get a hook-up, I also teach you how to present your bait in the best possible manner to catch a thrill of a life time. Steelhead fishing on the Rogue starts in January. The primary Steelhead season extends from January through March. Rogue River Steelhead range from 7 to 19 pounds, averaging 9-10 pounds. They are very exciting to catch as they will often jump out of the water 6-7 times! Whether we are fishing for Springers or Steelhead, I have the front 2/3rds of my boat fully enclosed and it is always warm and cozy, no matter what the weather is like during the day. We have installed a GoPro helmet camera on the boat, so we can take a live video of your catch. We’ve tested it out and found that the video is crisp and clear, and will make a great addition to your fishing memories. To top it off, I always serve a hearty breakfast on board. There’s nothing like enjoying a hot breakfast of turkey bacon, potatoes, farm fresh eggs, with salsa to top it off while you are waiting for the next fish to bite. It is my goal to serve the best breakfast to be had on the Rogue River during Springer and Steelhead season, and for you to leave at the end of day with wonderful memories to add to your memory list! Early Fall Chinook salmon start showing up in mid-July in the Rogue River Bay for some great fishing that lasts until mid to late October. Our Rogue River Coho Salmon come into the Rogue River Bay in mid-September and run to the end of October. Catching Silver (Coho) Salmon is a lot of fun. Coho Salmon are smaller than Chinook, but they are more aggressive and now and then we’ll get a double hook-up, with two anglers having fish on at the same time! Just to add to the excitement, once hooked, they may jump out of the water 4-5 times in the course of reeling it in! They run in size from 9 to 15 pounds, with an occasional Silver salmon that weighs in at 17 to 20 pounds. On the Rogue River you can only keep hatchery Coho Salmon, and must release any wild Coho Salmon caught. However that’s not the case on the Coquille, let me explain. I also fish the Coos and Coquille Rivers. The Coos Bay and Coos River has great Fall Chinook and Coho Salmon runs in September. The Coquille River is usually good in late September and October for Fall Chinook and Coho. On these rivers you may keep 1 wild and 1 hatchery per day of each species of Salmon. That is you can keep a single hatchery Coho Salmon or a wild Coho, and a single Chinook Salmon, for a total of 2 per day. 2012 is looking to be a very good fishing year, to date in 2012 I have guided 18 trips and landed 64 fish! Please give me a call and let’s get you and your friends on my schedule and make some fishing memories.